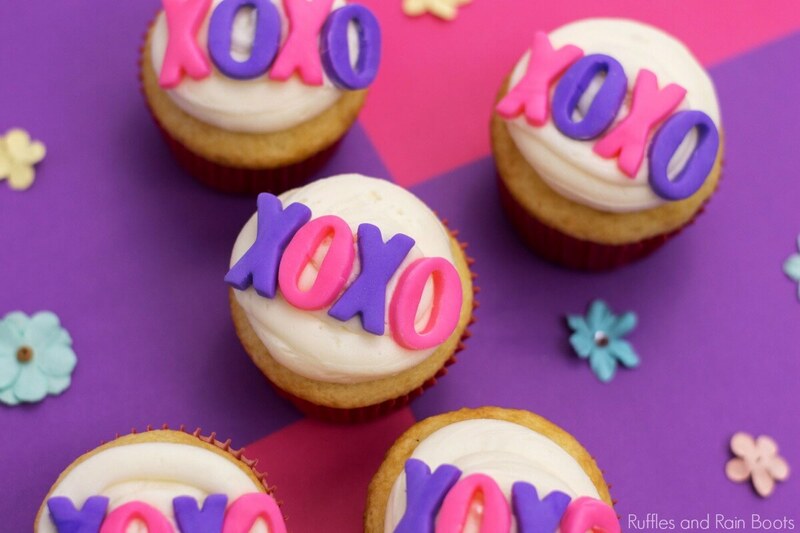 These fun XO cupcakes for Valentine’s Day are sure to bring a smile. They are easy and done quickly, so they’re perfect for class parties! Here at Ruffles and Rain Boots, we love a good party. But friends, I don’t love stressing about a good party which is why I like easy recipes and easy decorating ideas. 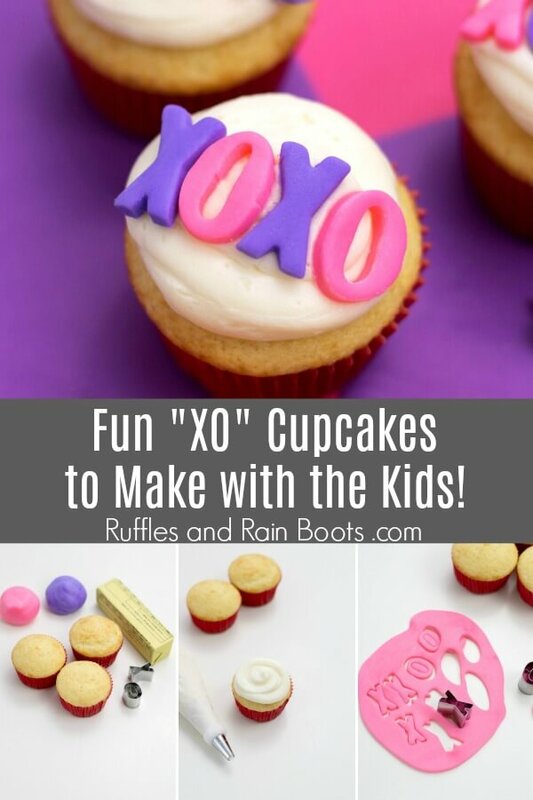 These XO cupcakes for Valentine’s Day are a perfect treat to make for a classroom party, a neighborhood get-together, or just as a fun way to get the kids in the kitchen with you. 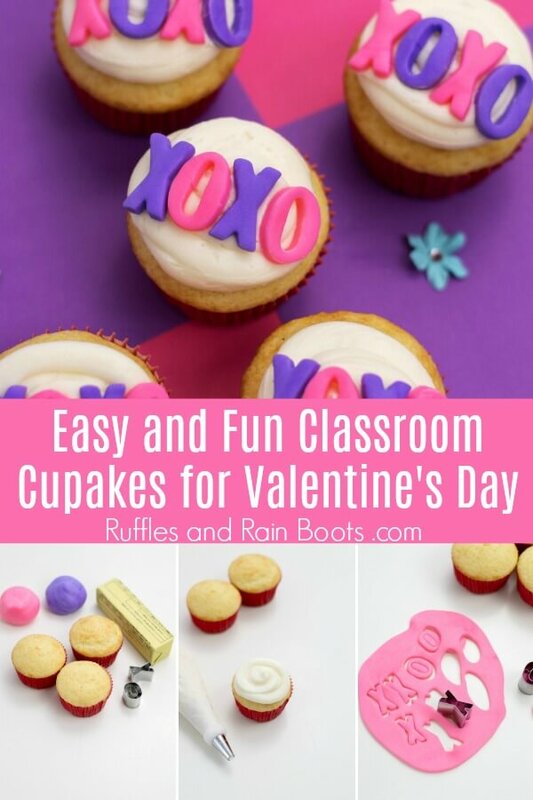 This is one of the easiest of our Valentine’s Day cupcake recipes. Let’s get started, but first I want to share a couple of tips. 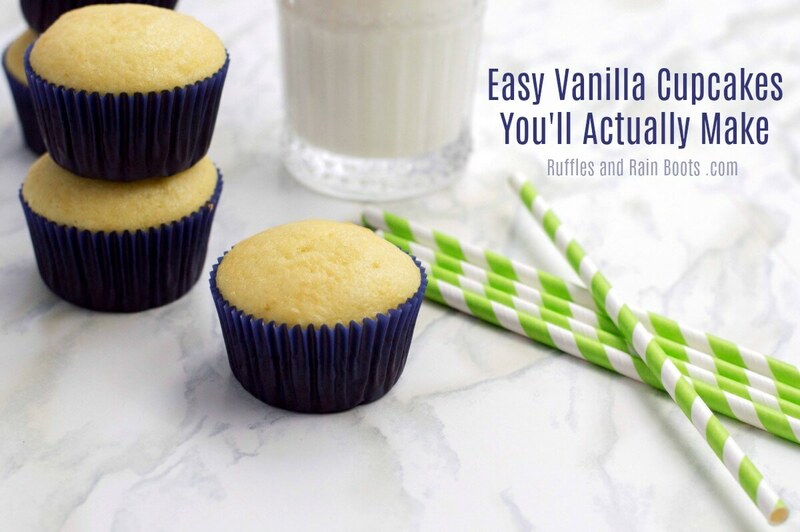 RELATED READING: Easy Vanilla Cupcake Recipe – Just Plain Good! 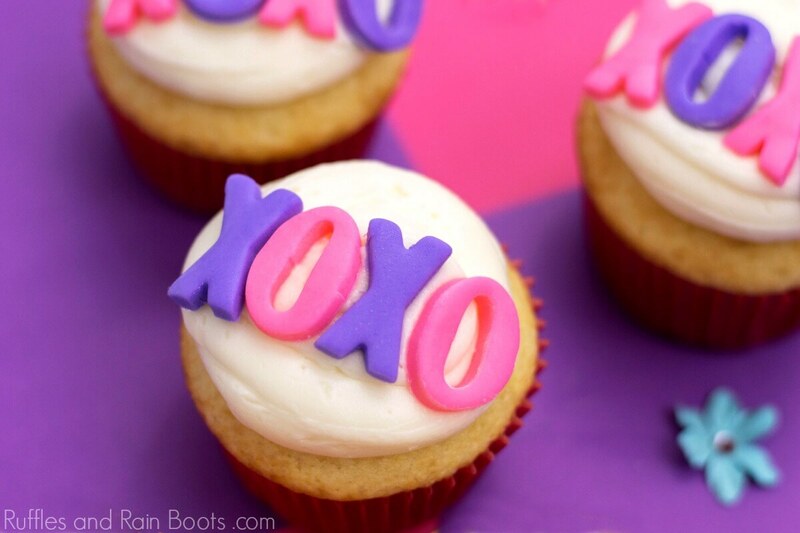 These XO cupcakes for Valentine’s Day are a perfect class party treat. They’re so easy to make and decorate, the kids can help. 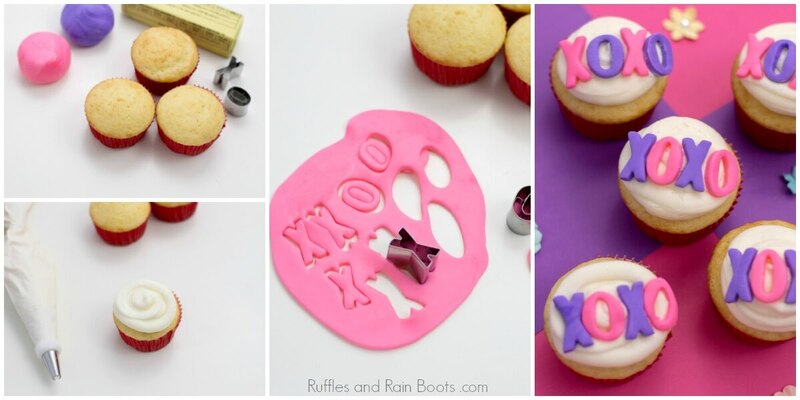 Here are a few tips for making these fondant decorated cupcakes. Sprinkle a bit of powdered sugar onto the surface before rolling out the fondant. If you have time, I recommend rolling and cutting the fondant in advance. This will give them time to dry and set up. Use alphabet cutters about 1-inch tall – we have these alphabet cookie cutters from Amazon and they’re great. Here on Ruffles and Rain Boots, we like easy. 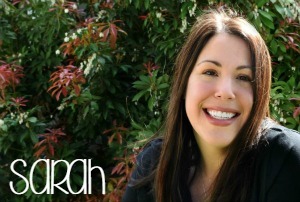 And that means recipes that appeal to both kids and the grownups who have to make them. If you need a vanilla cupcake recipe, I recommend making our Lazy Girl’s Easy Vanilla Cupcakes. They take less than 30-minutes and use ingredients you likely have on hand. 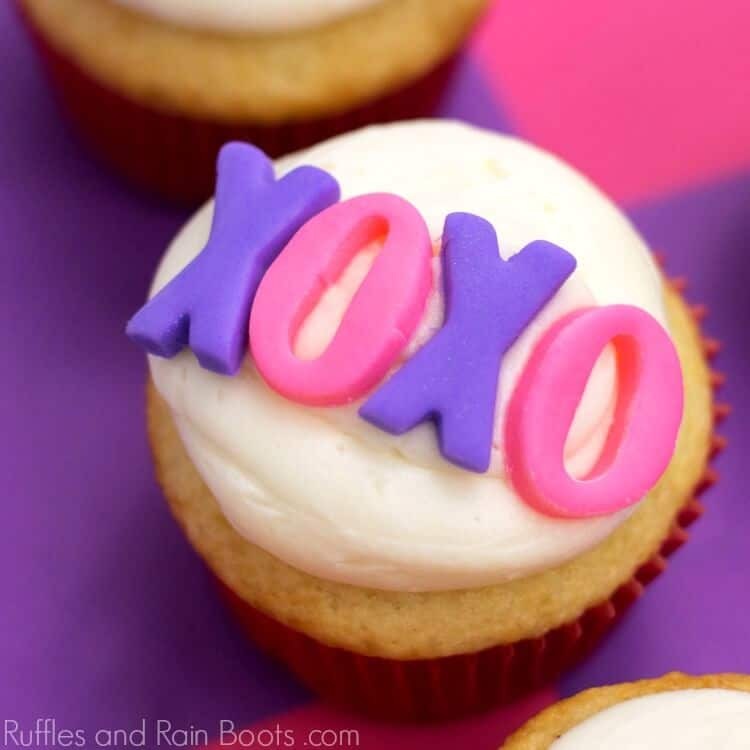 These fun XO cupcakes for Valentine's Day are sure to bring a smile. They are easy and done quickly, so they're perfect for class parties! Bake 24 vanilla cupcakes. Set aside to cool. While the cupcakes are baking, make the frosting. In a stand mixer (or use a large bowl and hand mixer), combine butter, sugar, milk, and extract. Once smooth, transfer to a piping bag with a round tip. Sprinkle a smooth surface with powdered sugar and roll out the purple fondant. Cut X's from it. Repeat with the pink fondant, making O's. Cut as many as you need for your cupcakes. We made 2 X's and 2 O's for each cupcake. Once the cupcakes are cool, pipe the frosting in a short swirl - don't build a mound. Place the X's and O's on the frosting and you're done! When using our Easy Vanilla Cupcake Recipe, double it for 24 cupcakes. All nutrition information is estimated and only for the frosting. Please see the vanilla cupcake recipe for calculations there. Always calculate exact brands and ingredients used when accuracy is desired. Printable Otter Valentines – so punny!